Am currently repairing a torah and have reached parshat Pinchas - always the worst condition as we know. However I think someone may well have got there before me as you recall the erroneous 'chametz - chamin' repair that someone had made that I uploaded recently. 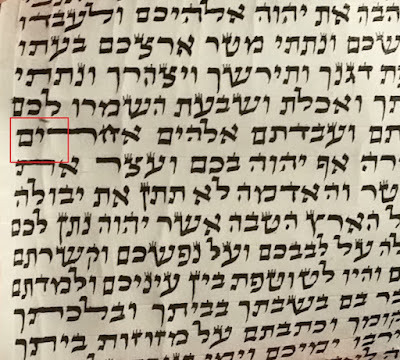 Well I think someone has also repaired the vav k'tiah in shalom (see below) as there is a little blob of ink on where the break would have been. Now technically this is not pasul as all of the visual midrashim ( as I like to call them - i.e. 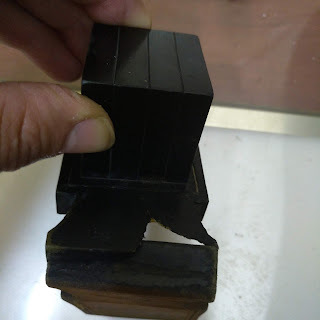 large, small, broken, bent letters etc) are just minhagim passed down from sofer to sofer, but we are nonetheless enjoined to 'fix' them if we come across them not being there.Now if this is kasher as it stands then what is the best way of fixing? Making a break would constitute chok tochot. Scraping the entire regel and writing afresh is the obvious answer, but here I am scraping a technically kasher letter to create a deliberately broken letter (though the length of the letter is a bit suspect as it is starting to look like a nun sofit but obviously isn't as it's in the middle of the word). However repairing something that is technically kasher seems a bit odd. The teymanim don't have the vav k'tiah in their sifrey torah so is there any argument that says I should leave it as it is? This Vav must truly be shown to a tinok in order to read. Although the head is rounded on the right, and doesn't protrude either, it may still be confused with a NUN PESHUTA. If the child reads it as a VAV, you may cut it where it has the small belita. That way the letter still keeps its shiur as a VAV. If the child reads NUN, you will have to cancel the letter and re-write it KETIAH as per the Minhag. Hi Alberto - I wouldn't say that this is a genuine safek to permit havchanot tinok. It is fairly obviously not a nun sofit. However if a child was to read it so it would as you say provide a good reason to erase and write k'tiah. I also agree it is not a safek of nun pshuta,in the contrary vavs should be written long the braysa write to be careful vav should not resemble yud and zayin should not resemble nun sofit.The M"B also write to be careful not to make long zayin ,however by vav he writes to be careful not to make short(M"B does bring that if you make it very long and a child reads it nun sofit it will be a problem.When purchasing mehudar mezuzos I allways check the word mezuzos -if the zayin is long and the vav is short i would not buy it. 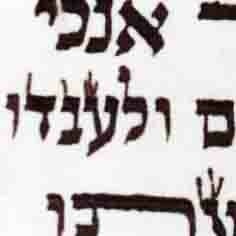 Please refer to Sefer Sefekut HaSofer where the HIDA is concerned that if the Vav is elongated to a length of the proportion of a NUN PESHUTA we are concerned that a Tinok would read it as such and it would be passul. Therefore, the halacha in accordance to the Sefekut HaSofer is that, such an elongated VAV must be shown to a Tinok. By showing it to a Tinok - all subjectivity is removed from the hands of the sofer; thus allowing Mordechai to proceed with the appropriate correction depending on how the letter is read by the Tinok.